Clearly, concisely, and with many examples from public and private enterprise, Upgrading LeadershipÃ¢ÂÂs Crystal Ball shows why predictions are usually wrong and presents a better way to look at the futureÃ¢ÂÂforecasting. This book is essential-reading for anyone who needs to make the best possible strategic decisions for moving an organization forward in todayÃ¢ÂÂs rapidly changing environment. Dr. Bauer supplies an insightful comparison of the two mainstream approaches for looking ahead. Although predicting and forecasting are usually used as synonyms for a single process, they are conceptually and methodologically quite different. He explains why everyday failure to operationalize these differences robs us of power to envision and pursue good futures, especially when we are headed in the wrong direction. Readers will learn the real-world value of distinguishing between predicting (extrapolating historical trends) and forecasting (estimating the probabilities of possibilities). Following a description of predictive modeling and a discussion of five reasons why it fails so often in current applications, Dr. Bauer explains the superiority of forecasting and how to do it. To complete readersÃ¢ÂÂ understanding of the many compelling reasons for making the shift from predicting to forecasting, Upgrading LeadershipÃ¢ÂÂs Crystal Ball presents a practical approach to strategic planning in unpredictable times. It concludes with an analysis of the future of big data and its likely impact on the future. 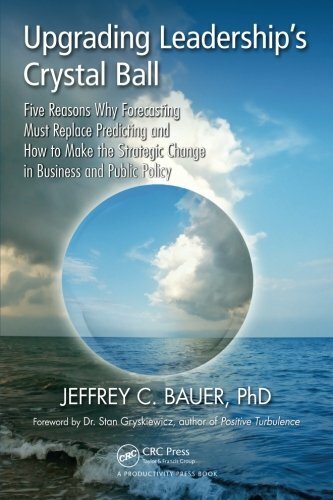 Dr. Bauer is uniquely qualified to write this important book; he is trained in both predicting (economics) and forecasting (meteorology). Author of more than 250 publications, he is internationally recognized not only for long-term success in foretelling the future of medical science and health care, but also for successful innovations to create a better delivery system. This book distills the lessons garnered over his 40 year career as economist and futurist into a guide that other leaders can use to avoid problems and create better options in any realm. The book includes a foreword by Dr. Stan Gryskiewicz, author of Positive Turbulence. About: Clearly, concisely, and with many examples from public and private enterprise, Upgrading Leadershipâs Crystal Ball shows why predictions are usually wrong and presents a better way to look at the futureâforecasting.